Arriving in Margaret River last Thursday fresh (or not!) 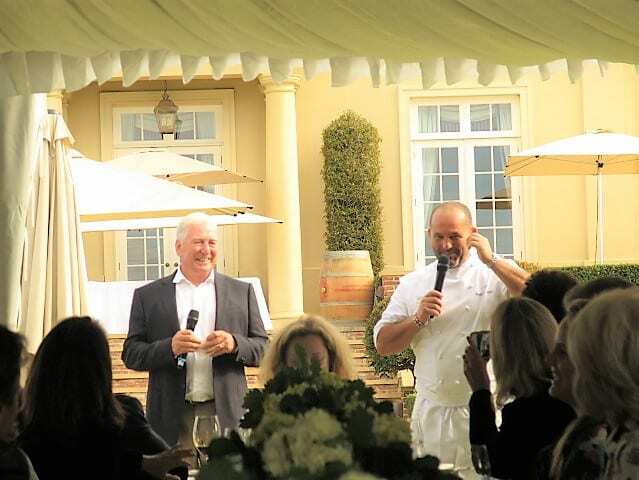 from my flight, I was pitched headlong into the heady whirlwind of fine wine and food that is Gourmet Escape 2018. I’d do it all over again! 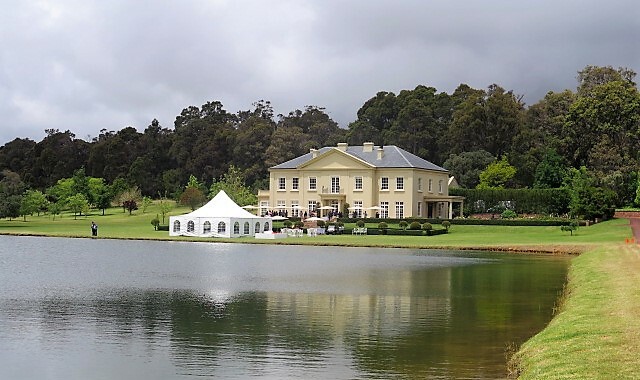 It has been fun speaking to the wines at Cape Mentelle International Cabernet Tasting, Cullen Chardonnay tasting & lunch and Fraser Gallop long lunch. What a hat trick! The atmosphere of this three day long annual event (the seventh) was really convivial and the food and wine top notch. I’d most definitely recommend entering Gourmet Escape’s competition to win a trip to Western Australia Gourmet Escape 2019 (8-17th November 2019) and a year’s supply of Larry Cherubino Wines (details here). Let me share with you a flavour of those events I attended. Cape Mentelle’s co-founder and original winemaker David Hohnen started this blind benchmarking tasting in 1982, a renowned Bordeaux vintage and, evidently, a great year for Margaret River too. Cape Mentelle bagged the first of two consecutive Jimmy Watson Trophy winners, bringing the trophy to Margaret River for the 1982, then the 1983 Cabernet. This was at a time when Cabernet regularly won the trophy and Bordeaux was very much the lodestar for a firmer style. Indeed, labelled Cabernet Dry Red Claret, Cape Mentelle’s then winemaker David Hohnen described it as a monster, undrinkable, in its youth. A quality which meant it was in impressively robust form when I tasted it this year, 35 years later (my notes on September’s vertical tasting here). So how did Margaret River’s Cabernets stack up against world class competition from Bordeaux, Napa Valley, Tuscany, New Zealand, Coonawarra and the Yarra? 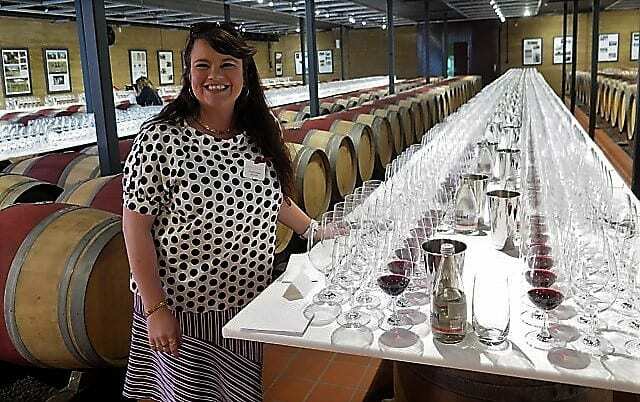 Each of the twenty-one wines was made in 2015 and, as you can see from Cape Mentelle’s vintage report below, Margaret River had its work cut out for it! Here is the list of wines as shown. Bordeaux 2015s have been described as charming and, I must admit, the charm offensive worked on me. With its dried roses, sensual fruit and slinky tannins – a certain delicacy – the Montrose was quite the thoroughbred. Confident, very polished, the Leoville-Las-Cases 2015 impressed with its perfumed fruit, structured tannins and gravelly finish. Tres classique, as was the toastier, spicier Ducru. First growth Mouton Rothschild lived up to expectations, exuding power from every pore. Broad, deep and long, this powerhouse was thoroughly three dimensional, with a pronounced ironstone/cut lip minerality. Brooding. The Napa wines showed a certain potency, with a marked density of tannin, especially the Togni, which I found intriguingly, coolly mineral. Though seductive, the flashier Spottswoode was just a tad warm for me. My pick of the three was the Newton Mount Veeder – lovely precision, polish and pull thanks to a dynamic acid/tannin structure. I found the lone representatives of Chile, Italy and New Zealand rather elbowy, the Chilean notably reduced. I know that Sassicaia 2015 has received barnstorming reviews, but my (winemaker) neighbour and I were at sixes and sevens with it. Turning to Australia, from Coonawarra, the Wynns (100% Cabernet Sauvignon) showed great varietal and regional typicity – very blackcurranty, polished and linear, which made it seem deceptively simple in the line up. It just needs time. Similarly the introverted, rather unforgiving Mount Mary from the Yarra Valley which, after an initial burst of blackcurrant, clammed up. In contrast, whilst the Cullen and Voyager Estate (with Leeuwin Estate, my pick of the bunch) held their cards a little closer to their chest, the Margaret River wines were relatively open knit, with resolved tannins, expressive fruit and an attractive freshness. Case in point, the hedonic 2015 Tom Cullity reminded me of a comment Virginia Willcock made at the London launch about the maiden 2013 being relaxed enough to drink now! The Cloudburst and Heydon Estate were among the more characterful wines in the line up, with distinct bush notes – eucalyptus/mint, peppertree and wattle. Not for the first time, the Cullen struck me as drier than its peers, with earth and gravelly, mineral notes as well as pretty violets. A super expression of terroir when you’ve tasted verticals from this estate (click here for my notes from the 40th anniversary vertical, back to 1981). Traits which, with a certain firmness, made me ponder if it was from Bordeaux or Italy, but it didn’t have the tannin density/extraction. From southern Margaret River, the Leeuwin Estate showed its southern roots – lovely perfume, freshness and lift with Margaret River’s trademark purity and brightness of fruit. Conversely, the much more brooding Voyager from close by surprised me; sponge-like tannins seemed to absorb the fruit, like clay with water, pulling you deeper and deeper into its dense but ripe web of tannins. Plenty of ironstone tang here too. Staying in southern Margs, the home bird from Cape Mentelle showed off its classy oak with a delicate dusting of coffee, cedar and anise and hint of mint to nose and palate. Being delicate, it was neatly interwoven with the succulent berry and currant fruit. Very much in line with her predecessor, Rob Mann, Frederique Perrin’s first vintage is medium bodied with a little more give to the fruit. Lunch afterwards was prepared by leading local chef Kate Lamont and, let me tell you, there’s no better welcome back to Western Australia than a marron starter. Perfectly cooked, very succulent. Top match with Cape Mentelle Chardonnay. Vanya Cullen’s father Kevin (after whom the Chardonnay is now named) launched this annual international benchmarking blind tasting in 1985. In the past, the line up has featured more international wines and just the one Cullen Chardonnay. 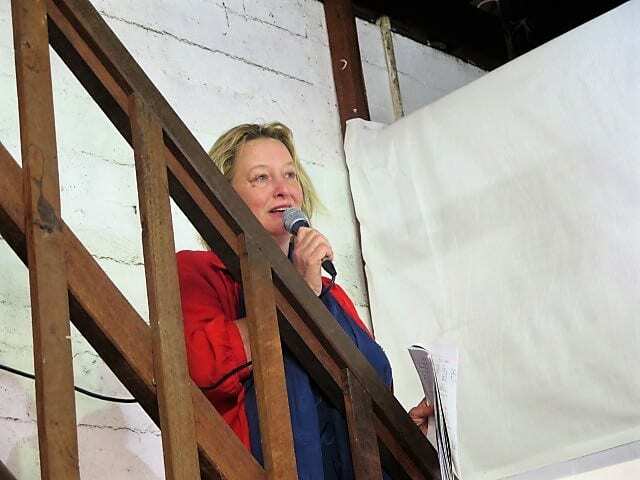 However, these days, in common with a fair few peers, Cullen is less interested in drawing comparisons with Burgundy than teasing out the differences between different Chardonnay sites in her region. Additionally, through Cullen’s Kevin John Legacy Series, exploring another dimension – the impact of the rhythms of the cosmos on site. To that end, this year’s line up of 20 Chardonnays featured 15 single vineyard Margaret River wines, including three rare as hen’s teeth Cullen Wines Legacy Series Chardonnays. With terroir front and centre, the other Chardonnays – from Beechworth, Tasmania, New Zealand and Burgundy – also came from single vineyards. On any view, it was an impressive, deeply pleasurable line up of wines, with high quality the common thread. Compared to when I started out in wine in 2000, even 10 years later, when I attended Wine Australia’s week-long Landmark Tutorials, Australian Chardonnay has become so much more nuanced, with texture and savoury, mineral layers – sometimes attributable to terroir, sometimes attributable to the human touch. The Landmark Tutorial was based in the Yarra Valley, which was a key player in the shift towards tauter and terroir-specific Chardonnays. Earlier picking, fruit sourcing from the cooler, Upper Yarra and much more measured use of oak and batonnage and malo (if any) here (and in Mornington Peninsula), introduced a new style of tighter bandwidth, sometimes austere wines. A much remarked upon pendulum swing which, at its extreme, sacrificed Australia’s signature purity and intensity of fruit. Ageing Chardonnay reductively on lees without batonnage produces the tightly wound, struck match aromatics and flinty palate so beloved of top Burgundy producers, such as Leflaive, Coche Dury and Roulot. An artefact which, at its high-water mark, can dominate a wine as much as lashings of malo-driven butter and cream or new oak driven toast and vanilla. Or pure, unadulterated sunshine in a glass ripe fruit. Cliff Royle of Flametree Estate is a fan and it enabled me to spot Flametree’s top SRS cuvee, where he deploys this technique to the max. It won’t be for everyone (and Royle makes classic more fruit-driven styles of Chardonnay too), however I felt that this wine still displayed an acid thrust, backbone, pure core of fruit and dried pear resonance which spoke of Margaret River’s Wallcliffe region and the Gin Gin clone. Giaconda Chardonnay also featured pronounced struck match notes. More prominent on the nose than the palate, they integrated on a rounder, weightier but superbly balanced palate (less angular than the SRS), showcasing Beechworth’s warmer, inland, continental climate. Conversely, whilst the SRS had pacy acidity, the Tolpuddle went into whiplash territory – beyond racy! My notes refer to savoury reductive notes for this wine too though, once I knew its identity, I wondered if those flavours are more terroir-driven. The Tolpuddle always puts me in mind of Alsace Riesling, with its whestone/volcanic, round not flinty minerality. Peppered with references to tight citric backbone, grapefruit, rock melon and dried pear, my notes indicate that the Gin Gin clone’s structure and fruit clarity was much in evidence, as one would expect with such a high quota of Margaret River wines. 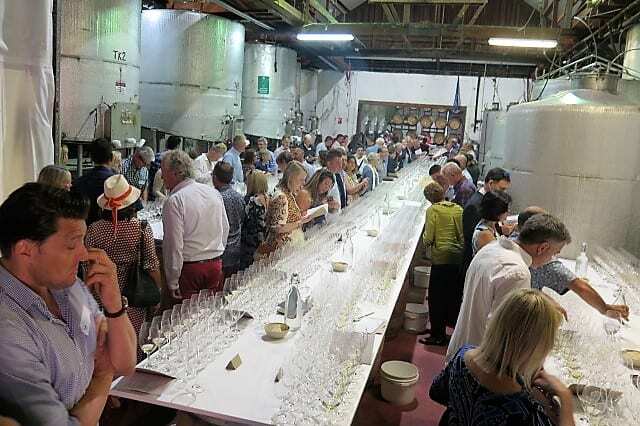 However, as at the Australia Day Tastings which I presented for the Margaret Wine Industry Association (reported here), the diversity of style amongst the local wines was impressive. From the classic poise of the Leeuwin Estate to the vividly etched Xanadu, the fruit power of Cullen to the funk of Flametree SRS, with everything in between. Lots to like here with some great value to be had (McHenry Hohnen, Fraser Gallop) and new discoveries for me (Heydon Estate and Grace Farm). Sometimes, a different (more open knit) fruit spectrum, crushed oyster shell/milky oyster or more involved (wild yeast) textural notes erroneously took me to France – the Lenton Brae (yellow plum, crushed oyster shell and almond paste), Voyager Estate (oyster shell, saline notes, glycerol) and Woodlands Chloe (cheesy/oyster milk) being cases in point. I’m not sure about the Woodlands, but the Voyager and Lenton Brae both feature Burgundy clones which tend to produce savoury accents and a more open knit palate than the Gin Gin clone. The Moss Wood stood apart for its oak – not a sledgehammer by any means, but part of the complex layering of this wine, which gave it a different structure. The Cullen Legacy Series’ wines were major outliers in terms of both appearance (deeper yellow), flavour concentration/profile and bandwidth. A vertical tasting at Cullen the next day confirmed what I already know about the Kevin John Chardonnay’s fruit clarity/power and ageworthiness. With the influence of lunar phases (fruit and flower days) squarely in the mix, both for the harvest of the grapes and the oak for the barrels, these Chardonnays definitely went into another dimension. They showed homeopathic levels of concentration and intensity to the fruit (quince, not pear, dried, not fresh fruit) and oak spice notes. Though the alcohol levels are not high, they felt bolder (a sense of distilled flavours?) and chewier (more dry extract?) too. I wondered about the impact of the oak, including tightness of grain of the biodynamic barrels, given the different oak spice profile and deeper hue of the wines. That these wines are unfined and unfiltered doubtless plays a role in their colour and texture too. Cullen Wines Kevin John Fruit Barrel Legacy Series Chardonnay was shown next to the Flower Barrel Chardonnay 2014. The fruit for both, incidentally, was picked on 5 & 6 February – fruit days. I found the former terrifically concentrated, with creamy breadth and savoury chew, chamomile lift and concentrated vanilla and butterscotch oak. One might have said dense, but then it takes flight on a confoundingly ethereal, lifted finish. The Flower Barrel, on the other hand, has produced a wine with like quince/dried pear flavours and spicy vanillin oak but, with pulsing acidity; bubbling along, a simmering palate is more open-textured. Both are deep, very long and involving. Impressive. Cullen Wines Kevin John MOSH was the last wine of the tasting, coming after the Domaine Bernard Moreau Chevalier Montrachet Grand Cru 2014. Both wines had terrific palate presence. However, whilst the Burgundy built slowly and steadily in the mouth, wearing its power lightly (and ultimately keeping its powder dry), the MOSH’s connection with its Legacy Series siblings was immediately obvious. It is similarly impactful from the off but, with Moon Opposite Saturn (MOSH), the fruit dial is up a notch. Seemingly fresher, fleshier and more perfumed, with rock melon, pear and dried pear, laced with lifted chamomile and spice. Chewy and involving like its siblings – almost a wildness about it – MOSH contrasts starkly with the ultra-poised Grand Cru Burgundy. MOSH was harvested on 2nd February – a flower day (as was the oak). This was a couple of days earlier than the fruit day harvested pair, which weigh in at 13.6% abv versus MOSH’s 13.2% abv. Going back to Burgundy, for the Patrick Piuze ‘Le Preuses’ Chablis Grand Cru 2014 and Domaine Bernard Moreau Chassagne Montrachet La Maltroie 1er Cru 2014, my notes mention oyster shell/milky oyster notes which, together with their restrained fruit, pointed me to their origin. As did the lack of fruit descriptives. Where, generally, the Australian wines’ acidity seemed punchier, more vividly etched, the higher acid of the three Burgundies – the Chablis – had javelin-like acidity, fine and long. Quite different. As it should be. Still drawing big brush strokes but, from New Zealand’s Otago, the Felton Road Chardonnay seemed to sit somewhere between the Margaret River wines and the French wines, with more dialled back, touch woolly, rounder grapefruit, a hint of earth, crisp acidity and skinny latte notes. Un-pushed. All in all, this was a great celebration of Chardonnay’s diversity – by country, region, site or makers’ mark. Even grape and oak harvest dates. After the big reveal, our thoughts turned to lunch in the marquee by the Chardonnay block. 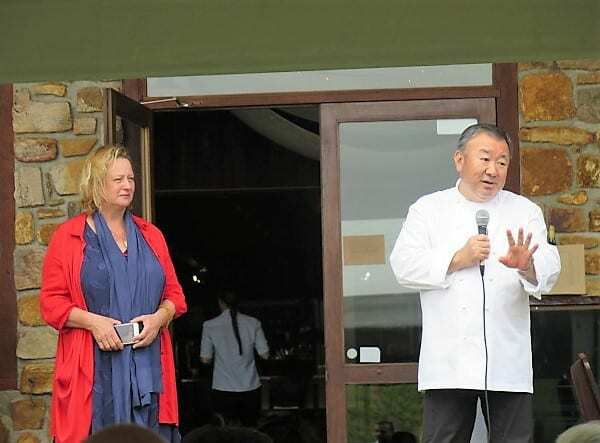 Under the auspices of Gourmet Escape since last year, access to top chefs has made this event more of a drawcard for international visitors. This year Tetsuya Wakuda of Tetsuya, Sydney, oversaw the menu, collaborating with Cullen’s two hats’ chef Iain Robertson (who created a delicious Busselton octopus starter). Sticking with Western Australia’s ‘west is best’ produce, Tetsuya served Dhufish for my main. As succulent and meaty as I remember, this is a fine white fish, up there with halibut. 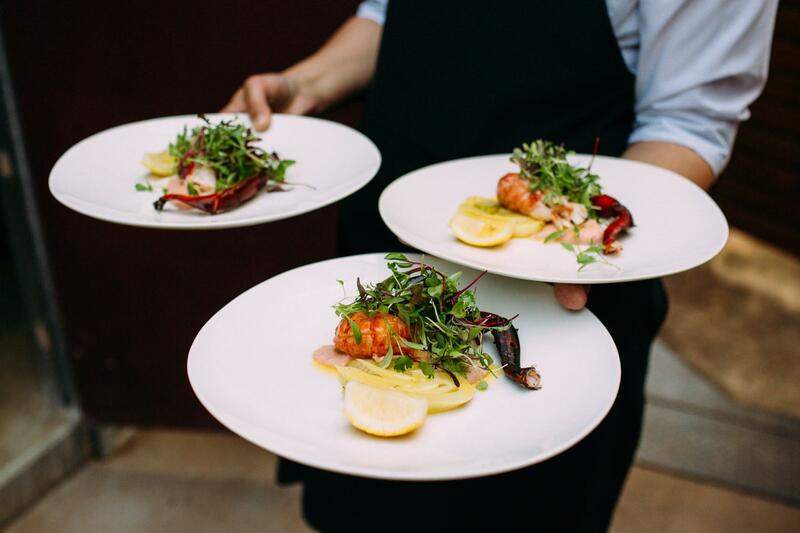 The abalone accentuated the ocean and introduced a touch of umami/iodine – a note commonly found in Diana Madeline (it was matched with the 2011 from magnum). 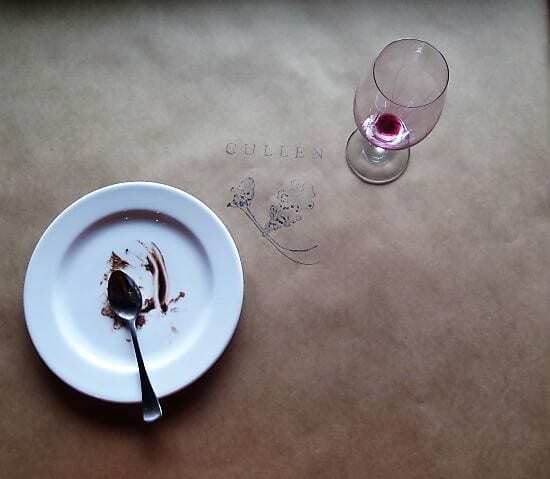 I have to say the dessert course and bold wine match blew me away – Tetsuya’s chocolate cake and Cullen Preservative Free Malbec, I could have licked the plate! In contrast with Cullen and Cape Mentelle, Fraser Gallop’s history is short. But, as Nigel and Dorothy Gallop’s house (pictured top) suggests, it is distinguished. Gallop Hall attests both to the scope of their ambition and source of inspiration. Within 10 years of selling his software business and planting the vineyard (in 1998), Fraser Gallop Estate Cabernet Sauvignon 2007 won Decanter World Wine Award’s International Trophy for Best Red Bordeaux Varietal over £10. Charged with presenting the wines, I took the opportunity to put this achievement in context. This year, 17,000 wines were entered into Decanter World Wine Awards and only 50 received Best in Show (formerly International Trophy) awards. And, I should add, a double magnum of the trophy-bagging 2007 tasted the previous day showed lovely purity and freshness to its blackcurrant fruit. I first tasted Fraser Gallop wines when I met Gallop in 2007. He had just taken on Clive Otto, who had made wine at Vasse Felix for sixteen years. Gallop wasn’t just interested in Otto’s pedigree. Referencing Cullen and Moss Wood, the Bordeaux lover told me back then that their early success in Wilyabrup with Cabernet had determined his decision to plant in this part of Margaret River. What’s more, emulating the region’s pioneers, he planted (and has dry-farmed) the local heritage clones – Houghton for Cabernet Sauvignon and Gin Gin for Chardonnay. Moss Wood’s Keith Mugford served as his planting guru. Fraser Gallop Long Lunch focused on these two lead varieties. As for the lunch itself, France also provided the inspiration in the shape of acclaimed French-born chef Guillaume Brahimi. Trained in three Michelin-starred restaurants in Paris before setting up on his own Down Under, he brought a gallic touch to Western Australian produce, which he praised to the high heavens. The first course provided an opportunity to compare and contrast Fraser Gallop Parterre Chardonnay 2017 with all-new release, Fraser Gallop Palladian Chardonnay 2017, of which only two (1,000l) barrels were made. Aside from quantity, the principal differences between the pair are threefold. First, Palladian comes from a lower yielding east/west-facing parcel which produces tighter, higher acid bunches which Otto vinifies in a “higher impact,” less fruit-driven style. Whilst Parterre is settled before it goes to barrel, Palladian’s press juice is not, so it goes to barrel with higher turbidity for a touch of funk and texture. This savouriness is complimented by higher toast Mercurey barrels. From a cooler year, both wines showed beautiful, quite muscular lemony fruit – tangy and lemon posset-like – long and persistent. As intended, the Palladian is more (oatmealy) textural, with subtle struck match/smoky oak lift. For both reasons, where the whole was seductively bound with smoked oyster mayonnaise, it was a glorious match with Brahimi’s tartare of snapper with green apple, samphire, grape and caviar. I imagine that, without the mayonnaise, the zingier Parterre may have been the better match. Brahimi matched tenderloin beef with truffle jus to three Cabernets – two vintages of Parterre Cabernet Sauvignon from 2014 and 2011 and the top tier Palladian Cabernet Sauvignon 2015. Like the Palladian Chardonnay, Palladian is a textural thang. 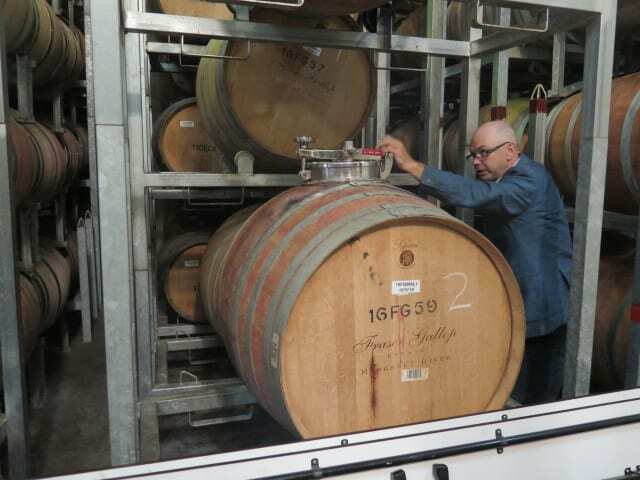 Otto had showed me the costly (AUS$3,000 -v- AUS$1,250) 500l roll-able French oak “vinification barrels” in which it ferments on skins. He explained that, just as Chardonnay benefits from barrel fermentation vis a vis oak integration, the same is true of reds. Naturally fermented and bottled un-fined after 22 months in new oak, I’ll borrow from the beef – this 100% Cabernet from a handful of top-performing rows is as tender as you like – really smooth and velvety. It has gorgeous mouthfeel for a Cabernet, which enhanced its sense of purity. Interestingly, it’s not as blackcurranty in focus as the Parterre. I picked up softer, more yielding berry and cherry notes, especially mulberry and red cherry, which sits well with the style. Bitter chocolate – a classic Margaret River note – too. Good to see a top tier wine go for elegance over sheer extract and power. With tobacco and cedar riffs to their blackcurrant fruit, the super-classic Parterres are Cabernet-driven, fresh and poised. Bordeaux’s salt and pepper shaker bit part varieties (Merlot, Petit Verdot & Malbec) lend floral and spicy nuance, as well as a dynamic, taffeta tannin structure (which Otto accentuates with different maceration techniques – cold soak or not, long skin contact or not and macro-oxygenation). I detected classic Margaret River kelp/nori in the 2014 which, with age, was more pronounced in the 2011. The 2011 additionally featured balsamic and salty notes to its blackcurrant and mulberry fruit. I liked Otto’s reply when I asked what key messages he wanted me to relay at the lunch. He said, “a sense of place…not doing anything to hide the fruit……,” which could not be more resoundingly expressed than in Western Australia’s first ‘ice wine’ – Fraser Gallop Ice Pressed Chardonnay 2018 (which was first made in 2013). The winemaker had made a noble (rot) wine at Vasse Felix but, given the aim was not to sacrifice varietal expression, he eschewed this method and the cane cut (raisined berry) approach. Harvested, if anything, earlier than the dry Chardonnays (on 19 February), the grapes were frozen and kept at minus 16 degrees centigrade for five nights. The grapes were then pressed and, being frozen, only yielded concentrated sugar solution (just 240/t versus 500l/t for Palladian). Following settling it was then (naturally) barrel fermented and aged for four months in French oak barrels, 50% new. I was surprised that this wine had seen oak. Whilst there’s a subtle barley sugar note, if anything, it seems to buff the classic Gin Gin pear and dried pear fruit with a dash of lime to a lovely shine. Deftly made, whilst it has 155.6g/l residual sugar – higher than I thought – it has 9.6g/l total acidity, which makes for lovely balance and persistence. With time in glass and, as the temperature rose, it showed more almond/apricot kernel notes. 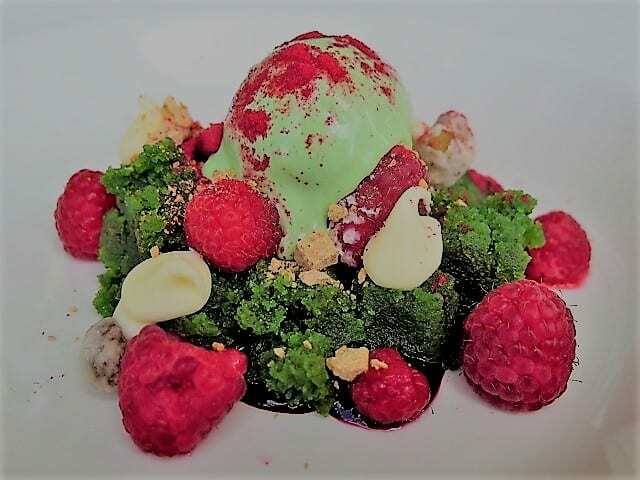 Worked a treat with this delicious pudding with its clever touch of tartness (the raspberries) and richness (the pistachio cake) and sweetness (the dabs of white chocolate). Another lick the plate clean job!